Perhaps it was quite courageous that this former French teacher, turned superstar author, from Harrogate, informed her audience, in the Baptist chapel in Haworth - within sight of the literary shrine - that it had not been the Brontës who had influenced her to write The Thirteenth Tale. It was from a very different kind of writer - the writer of psychological thrillers, Patricia Highsmith, a writer who herself very much preferred her own personal life to remain private - that she gained inspiration. After reading avidly the stories about 'the incredible Mr Ripley’- whom Mrs Setterfield described as an amazing character- living a double life- with those around him thinking he was an honourable, successful, conventional business man. So Mrs Setterfield thought that she might be the one to put the record straight- might be the one to give Mr Ripley the somewhat dubious credit he deserved. She had no wish to pick up the mantle of Highsmith but was left with a ‘pressure cooker’ of desire. Walking home across the Stray, in Harrogate, a voice came to her, a voice with a bullying, hectoring tone and, as if in the grip of some unknown force, she raced home and began writing- thus The Thirteenth Tale was born. She went on to describe her book’s equivalent of Mr Ripley- the famously reclusive Vida Winter who decides, for the first time, after a lifetime of lies and tall stories, to tell the truth about her life. She summons biographer Margaret Lea - herself somewhat reclusive- a person who likes to remain on the margins of life. Both women desire not to be known but come together to tell Miss Winter’s story. 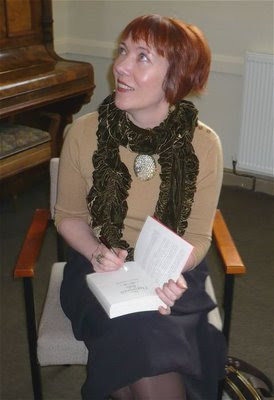 Mrs Setterfield described , to a captivated audience, that she thought of life as compost and, whilst she emphasised that the Winter character was in no way autobiographical, the idea for her characters came from her dreams, her conversations, books she had read and people she had met and she had drawn from this ‘compost’ to write the book. However, if left long enough, all the individual things that go in to make a compost heap will disappear and will become one rich mulch- the imagination. Some stuff does not decompose straight away and so it is, in our own minds, with dreams. Like eggshells that are instantly recognisable for quite a while, which keep surfacing through all the other stuff, dreams can stay with a person or can keep turning up unexpectedly. Mrs Setterfield’s ‘eggshell’ was the dream of a library on fire with two people fighting in the flames. Certain things in a compost heap never disappear - an avocado stone stays there permanently and the author’s ‘avocado stone’ was a story related to her by one of her French students, who, being told, at the age of eighteen, that he was born a twin and that his brother had died when he was three days old, said ‘So that’s it’- he had always known there was ‘something’ but had not known what that ‘something’ was. 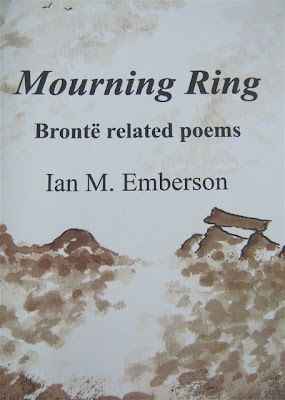 Mourning Ring by Ian M Emberson was published on October 1st 2008, and is a small collection of poems relating to the Brontës – their lives, writings and the landscapes associated with them. It is an expanded version of a previous publication Three Brontë Poems, and is lavishly illustrated by the author, with a picture on each page. The composer Robin Terry is working on a song-cycle based on the poems, and it is hoped that this will have its first performance in Haworth next year. Angria Press, 1 Highcroft Road, Todmorden. UK. OL14 5LZ; telephone (01706) 812716; e-mail ianemberson@aol.com.